pre-trip Information Package which tells you what you'll need to bring including recommended clothing. transportation to and from the put-in. sea kayaks, paddles, PFDs (life vests), spray skirts, dry bags. 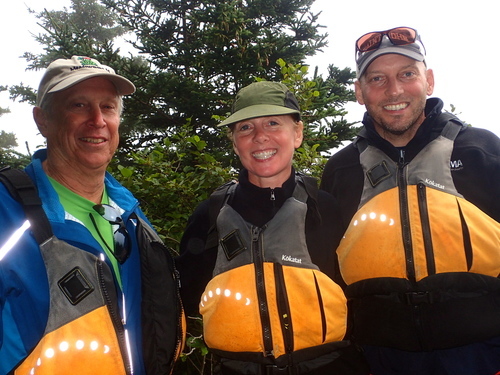 guiding experience of a professional Maine Guide - Peter has six years kayaking experience in the region. 10% of the cost of your trip goes to local organizations that help preserve these islands. meals and snacks for your sea kayaking trip starting with lunch on the first day through to lunch on the final day, though you're welcome to bring along your own supply of extra snacks. tents, and all camping gear - cooking equipment, tarps, lamps etc - for the campsite, all except sleeping bags and sleeping pads. (If you'd like to rent a sleeping bag and a pad, let us know sleeping bags will be freshly laundered). permits and / or approvals for overnight camping. 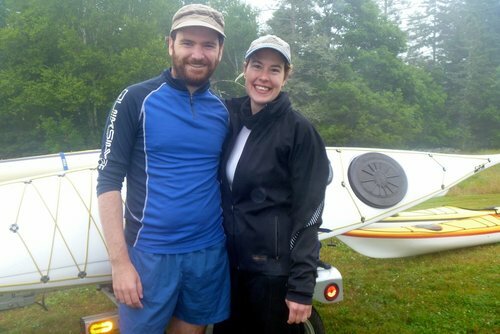 We've recently written some book reviews on sea kayaking you might find useful, check them out on the Island Notebook page. We're committed to trip safety - it’s our number one priority. It’s our job to make sure you're dressed correctly and feel safe and at all times. We'll provide you with a detailed list of suggested clothing in your Pre-Trip Information Package. and we'll provide training, if needed so that you're safe on the water. We recommend wearing a wetsuit (you can rent from us at a nominal cost). Waters around Deer Isle and Stonington can be hazardous and the weather, even in summer, can change rapidly. We'll provide you with a detailed NOAA weather forecast and information about currents and tides We'll text you with a weather snapshot 24 hours before a trip. We'll also get frequent weather updates from NOAA on multi-day trips. Trips are suitable for active singles, couples and families with teenage children (age 14 and up) with a maximum of four paddlers in the group. You should be in good physical condition since we'll be paddling between four and six hours a day. However, the trip will be designed to be less challenging if the group is made up of novice paddlers. If you're a beginner, we'll start slow with some flat water practice and you'll find that your paddling technique and confidence will steadily improve throughout the day. If you reserve a trip and decide to cancel, we will fully refund the cost of the trip if you cancel 90 days before the trip. We will refund 50% of the cost if you cancel 60 days before the trip. Less than 60 days and you will forfeit the cost of the trip. Driftwood Kayak reserves the right to cancel a trip at short notice if the conditions are unsafe. In that case we will reschedule the trip. It's really important to us that we provide a quality experience with solid value. We're committed to making sure that the trip is right for you, the customer. It's important to us that we provide you with a quality experience, a trip that you'll remember as being "something special I did that summer" and we'll do our very best to make this happen.